220 pages | 19 B/W Illus. This monograph explores the way that the profile and the critical functions of the holy fool have developed in European cinema, allowing this traditional figure to capture the imagination of new generations in an age of religious pluralism and secularization. Alina Birzache traces the cultural origins of the figure of the holy fool across a variety of European traditions. In so doing, she examines the critical functions of the holy fool as well as how filmmakers have used the figure to respond to and critique aspects of the modern world. Using a comparative approach, this study for the first time offers a comprehensive explanation of the enduring appeal of this protean and fascinating cinematic character. 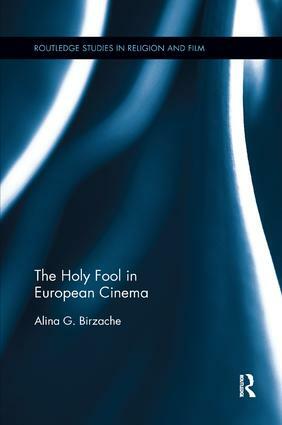 Birzache examines the trope of holy foolishness in Soviet and post-Soviet cinema, French cinema, and Danish cinema, corresponding broadly to and permitting analysis of the three main orientations in European Christianity: Orthodox, Catholic, and Protestant. This study will be of keen interest to scholars of religion and film, European cinema, and comparative religion. Introduction. 1. The Pauline Holy Fool and Its Successors. 2. Speaking Truth to Power: The Holy Fool in Soviet and Russian Cinema. 3. Holy Fools in the Films of Andrei Tarkovsky. 4. The Suffering Fool in French Cinema. 5. The Bressonian Holy Fool. 6. The Fool’s Challenge to Reason in Danish Cinema. 7. Idiocy as Technique: The Dogme 95 Movement. Conclusion. Alina G. Birzache was an assistant lecturer at the Faculty of Orthodox Theology in Bucharest before she moved to the United Kingdom where she obtained a PhD from the University of Edinburgh. She has interests in religious representations in art, literature and film and has published on these topics.